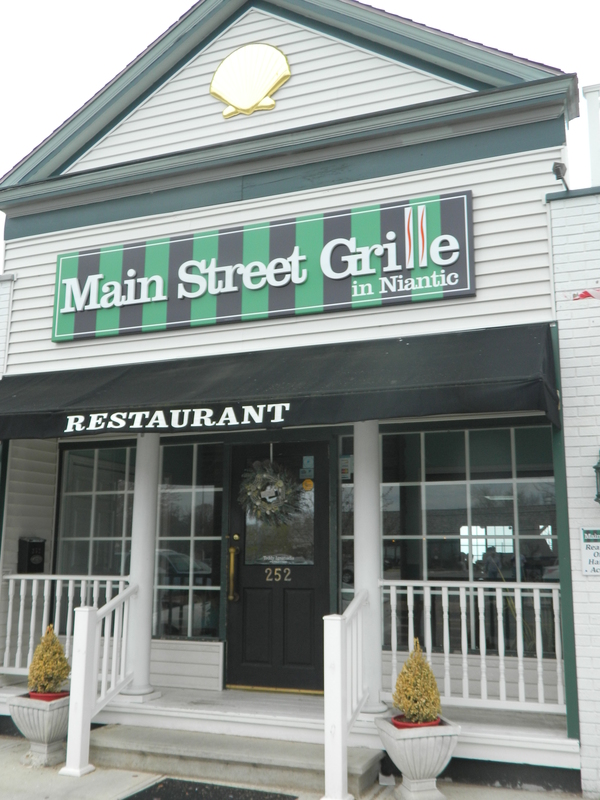 Formerly Constantine’s, Main Street Grille now operated by Teddy Ignatiadis, is located in the center of Niantic village. 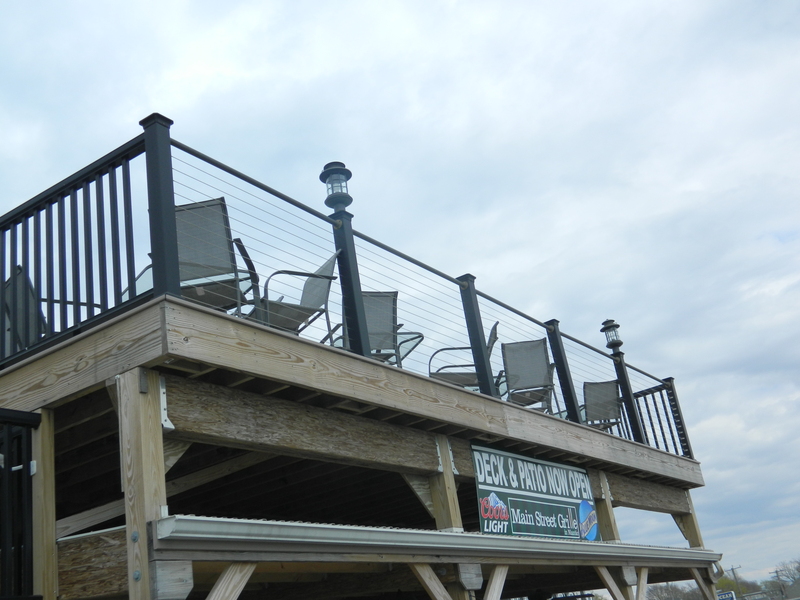 The front entrance is on Main and a rear upstairs deck overlooks the water of Niantic Bay. Handicapped access is a lower level rear entrance. 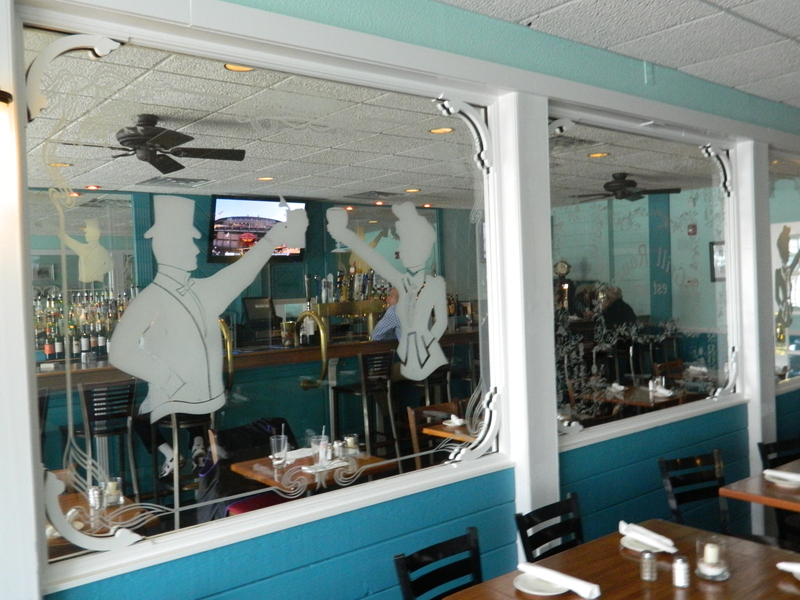 Inside, the main dining area has long patio doors in the back, and there are plenty of windows in a smaller front dining area and adjacent bar, offering an outside view from pretty much any spot in the restaurant. Delectable Lobster Bisque with a huge chunk of lobster. With warmer weather finally having arrived after a long, hard winter in New England, and, with summer just around the corner, this was a day to enjoy seafood. 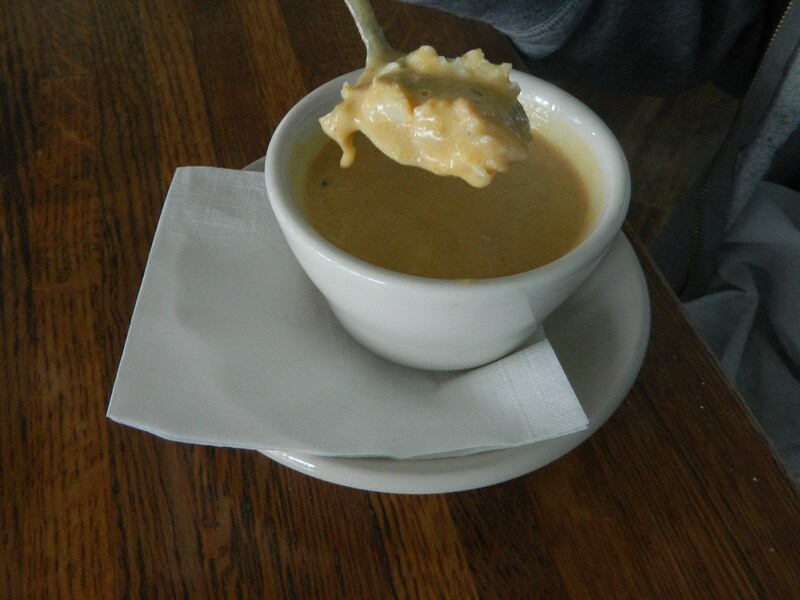 An especially tasty selection was the Lobster Bisque, with a large chunk of lobster which was positively delectable! The grilled salmon, served with an artistic dripping of white sauce, and the scallops were both cooked to perfection. Each came with two sides of the diner’s choice from a wide selection of sides – the chosen mashed sweet potato at a $1 more, sauteed mushrooms, onions and peppers mix and cole slaw all got positive reviews. For the landlubber in the group, the teriyaki chicken was also good. Dinners were served with an uneventful basket of white rolls – three rolls in the basket, refilled at no additional charge upon request. 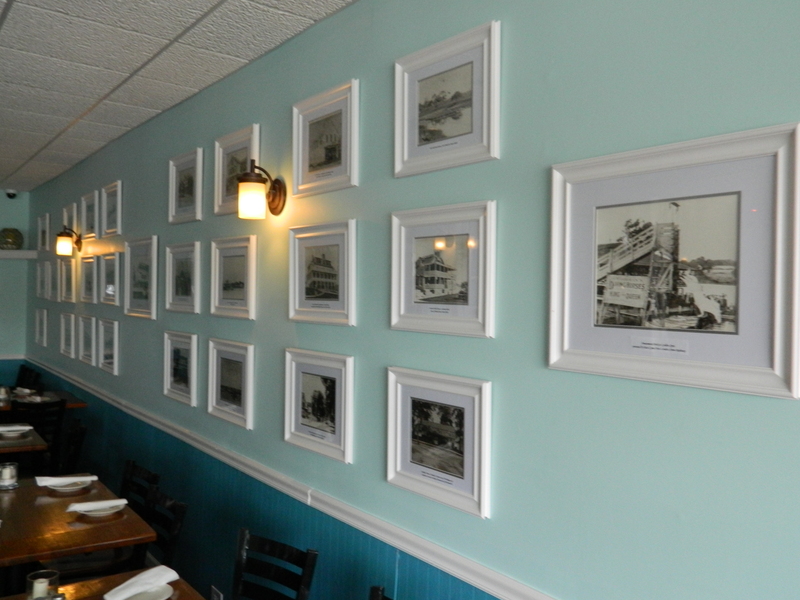 In the bar, a wall of local history photos. 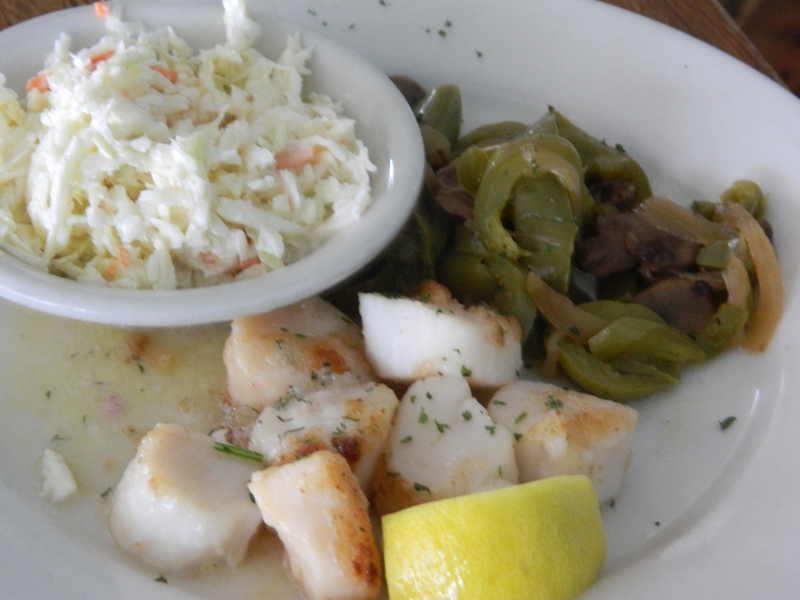 Scallops with sauteed mushroom mix and coleslaw. 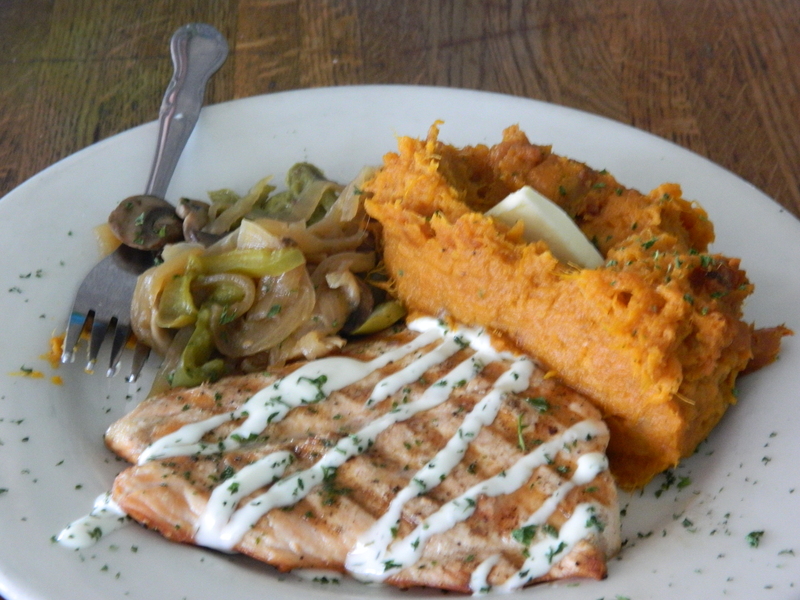 Salmon and mashed sweet potato. Many dishes on the typical American cuisine menu are prepared with individualizing touches and they offer a Sunday Brunch. Didn’t make it to dessert, however they have it, including creme brulee which is not found everywhere, and a variety of after dinner dessert drinks. Decor is soft colors and ocean themed framed prints. In the bar is an interesting wall filled with a long row of local history photos. The food at Main Street Grille is tasty, the prices for entrees range from $11 – $30, sandwiches and burgers $9-$16, soups, salads and appetizers $3-$12. 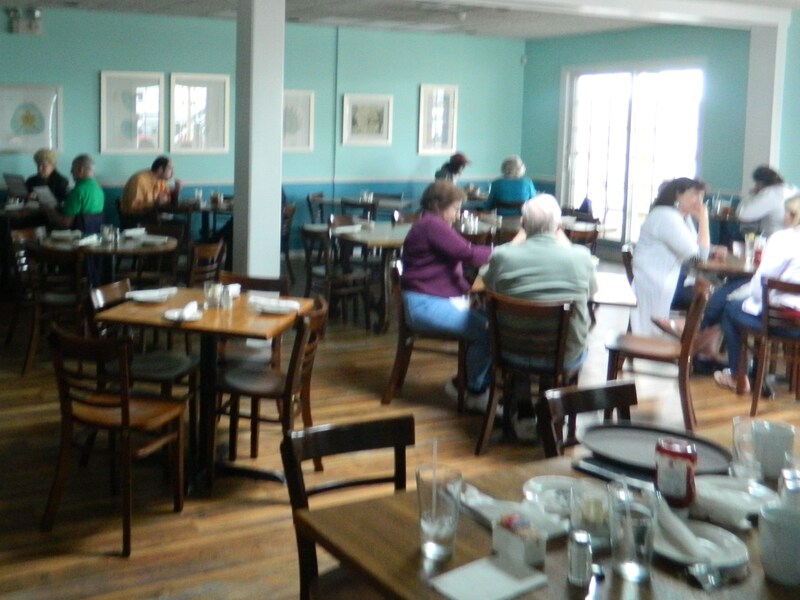 The atmosphere is relaxed – it’s worthy of a return visit – 252 Main Street, 860-739-5300. Due to its close proximity to Rocky Neck State Park, the population of downtown Niantic swells during the summer. The village has a few other restaurants, ice cream and frozen yogurt spots, a funky-looking downtown theater – a rarity nowadays- and a popular used book store called the Book Barn.